A fellow blogger contacted me about a few of the old images I’ve posted a while back. I started following his blog and found that he was posting these Sepia Saturday posts about old photographs. Well, I finally checked into what Sepia Saturday is, and decided to have a go at it! I’ve got PLENTY of old family photos and it will be fun to share a few here along with their history, maybe not every week, but as often as I can. The Sepia Saturday creator gives a few weeks out in advance, so I might actually be able to keep up. Today’s theme is weddings. First up is I think the oldest wedding I have a photo of, that of my great-great grandmother and great-great grandfather, Jessie Battin and Alfred Powis. They were married 19 Feb 1891 in Clearfield, Pennsylvania, USA. They both came to PA from England and ended up staying in the same house their married lives. I haven’t been able to find out much about the photographer, but I was told that the skirt of her dress was green velvet which is a neat little detail and far from the traditional white wedding gown that’s typically worn today. Other neat things to note are the hole in Alfred’s shoe and his IOOF pin on his vest as well as the fact that his pants are some sort of plaid print while his jacket is pinstriped. That iconic mustache stayed with him his whole life and I don’t have a single photo of him with a clean shaven face. 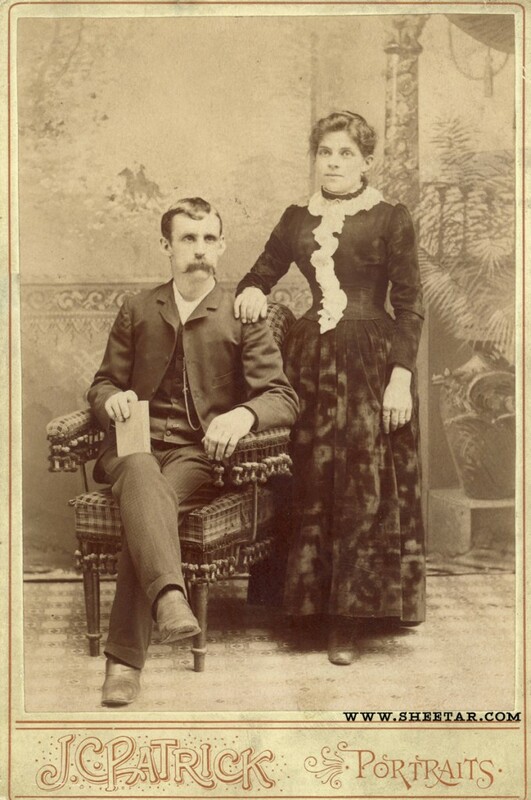 Next up is Jessie’s sister, Mary Jane’s marriage to John Samuel Creber. Dave Creber provided a wonderful detail of the people in the photo, so I’m going to copy that in here. The couple eventually moved to Canada but Mary Jane kept in close contact with her sister still in England as well as the other two in Pennsylvania, USA. Many thanks to Dave Creber for helping to fill in these precious details! 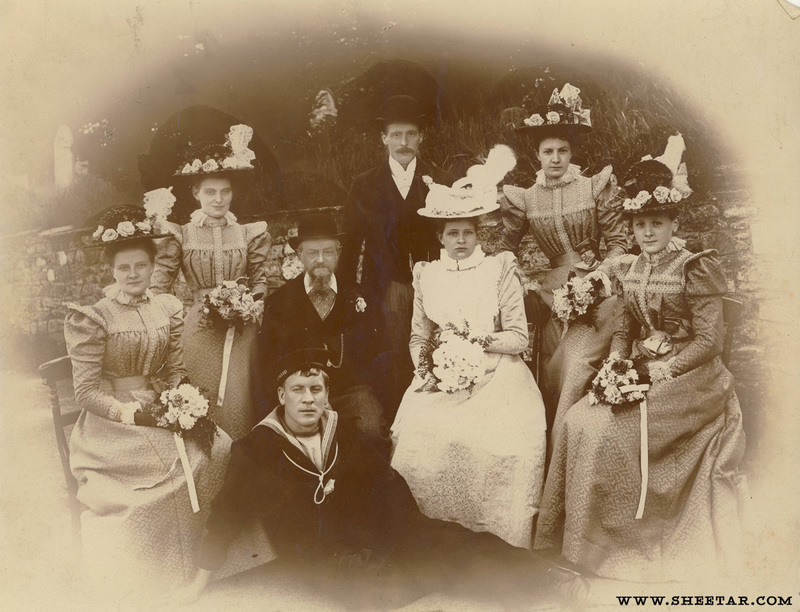 Photo is wedding of John Samuel Creber and Mary Jane Battin (14 June 1898, St. Michael’s, Lawhitton, Cornwall, England). Others in the photo are (l to r): Kate Battin, Laura Rallison (Emma Emily Battin’s daughter), George Battin, John Samuel Creber, Mary Jane Battin, Bess Battin and Emily Creber (sister of John Samuel). Man sitting on the ground is Theophilus George Creber, brother of John Samuel Creber. Here we have Bessie Melita Creber’s marriage to Alfred Norman Harris on 18 June 1927 in Montreal, Quebec, Canada. Bessie is a child of John Samuel Creber and Mary Jane Battin. 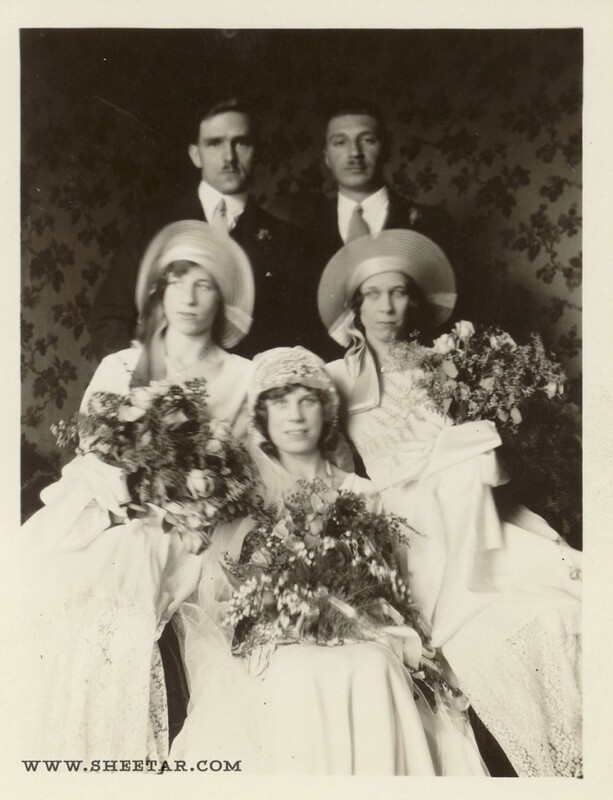 In the photo, Bessie is standing between her father and her new husband with her brother Alfred on the far right, and her sister Mary Victoria third from the left. I’m not sure who the other two men are on the left nor do I know who the child is in the center. Interesting to see such a short dress, but elaborate bouquet and veil. 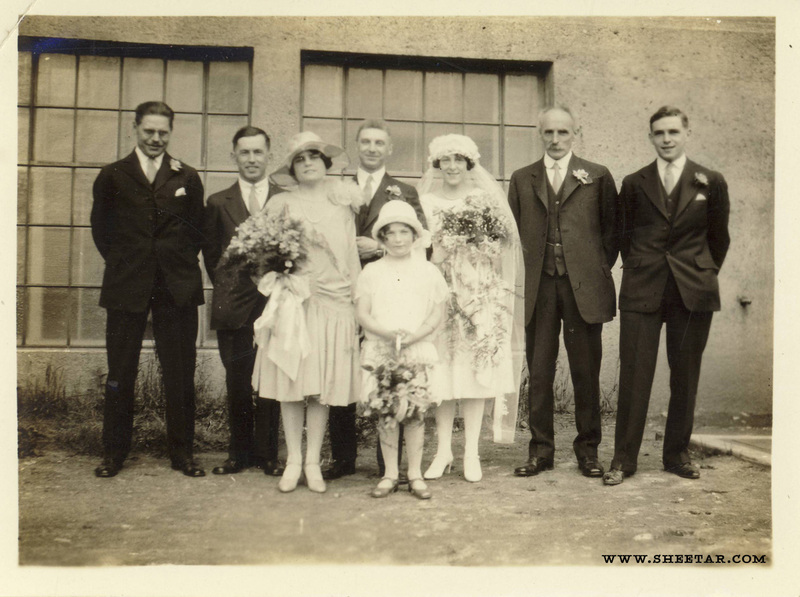 My final wedding photo is of Alfred George Battin Creber’s wedding to Ruby Winnifred Esther Watson on 27 Dec 1930 also in Montreal, Quebec, Canada. The date explains the indoor photo, I guess. Alfred, as mentioned above, is Bessie Melita’s brother (both are my great grandmother’s cousins), and is in the back on the left. Ruby is front and center, but I don’t know who the other two ladies or the man on the right are. The indoor photo explains the slower shutter speed and motion blur, but you still get a pretty good idea about the flowers, dresses, and veils and hats. Those hats really are something spectacular. I’m keeping my first Sepia Saturday short and sweet, since I really just wanted to share these neat photos and how they relate to one another. I just have SO many photos, and it’s almost a shame to keep these really incredible family photos all to myself. I’m hoping to continue posting with the weekly theme, and hey, maybe it will help me connect to living descendants of the people in these old photos.